Following a prologue set during the Vietnam war, reporter Daniel Ellsberg starts smuggling out reports which highlight how the US government was lying about the validity and direction of a potential (and then very real) war in Vietnam. We are later introduced to Washington Post owner, Katharine Graham [Streep], who is taking her company public to ensure its future but simultaneously feels doing so would rob her lineage of control over the paper itself – something her father and grandfather insisted upon. We later learn that Graham was never the intended head of the company, that The Post was left to her husband before he committed suicide. The editor in chief of the paper, Ben Bradlee [Hanks] is performing his duties as normal when he realises that one of The New York Times’ top writers hasn’t had a story for months – which invariably means he is working on some big scoop. It is later revealed that the story in question is an expose about the leaked government documents. Following an injunction from the White House, the Times is told it is not allowed to publish any further findings. Through a combination of investigating and luck, one of Bradlee’s writers come across the papers and both Bradlee and Graham are forced to decide what is more important, the company or the truth. The central talking point of this release was always going to be twofold: the acting and parallels with the current White House administration. Tackling the former, the script doesn’t offer a great deal to stretch the abilities of those gathered but what is on display is still damn fine entertainment. On the one hand you have Tom Hanks leading the charge of freedom of the press, commanding a pool of outraged writers all of whom are desperate to go after the government for the lies they told in an attempt to make a statement and notable change to how things operate. 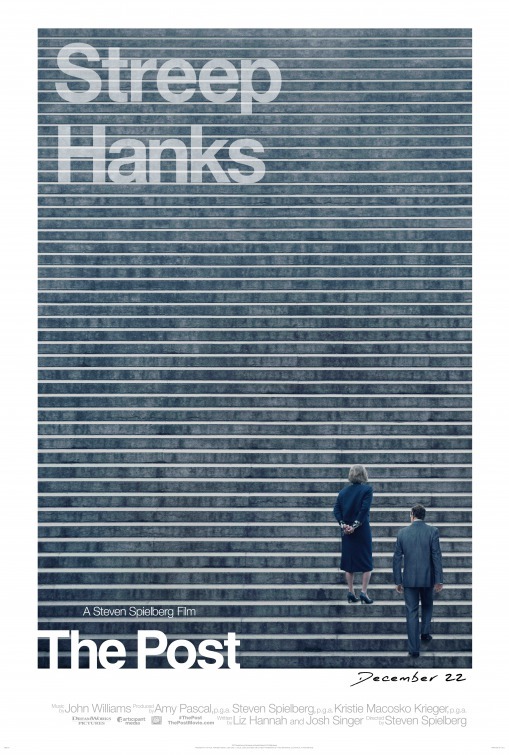 Hanks’ manner and cadence are brasher than the performances we have become used to but underneath it, he is still operating in the same way he always has in recent years – being a relatable, charming, proactive character with a wise, doting wife who acts as his counsel. The other half is Meryl Streep battling a board of old white men who believe she is not suitable for the position she currently holds, that no woman can take the place of a man; so while trying to retain control of her family’s newspaper for her children and grandchildren, she is making bold practical statements about a woman’s place in business management. Admittedly, I was initially taken aback by Streep’s portrayal, if only because the advertising failed to convey that Streep’s character lacked a degree of outward confidence and that her unsureness is part of what makes her a compelling individual. The assembled supports are all impressive enough but again nobody is pushed to do anything overtly demanding or outside their experience/expertise; if anything we are left with a conveyor of famous faces that crop up in various roles. I will note though, that Streep’s discussion with her daughter (played by Alison Brie) is very interesting. She talks frankly about her husband’s inheriting of the company, that she didn’t see this as at all unusual. This raises a great deal of comments and questions about the evolution of “a woman’s place”, gender politics and the fact that there is the constant presence of extra scrutiny over her actions, solely because of her gender rather than her capability. It’s a scene that is acted brilliantly but doesn’t say anything new. But then again, maybe it’s not supposed to, maybe it’s just saying the same thing over and over until the mainstream listen and act accordingly. Which, in a way, reflects the general message of the paper’s publishing plot thread: if you have a voice, it is your responsibility to use that voice for the common good. As can be expected from a film with access to resources of this nature, the production design is magnificent, as are all the period-relevant aspects. Janusz Kaminski’s lights the set pieces superbly, cornering out where one need focus in something like a busy newspaper office with tens of desks, writers and clacking typewriters to distract the eyes. I would also add that The Post contains some of the more creative shots than that of any Spielberg film in recent years. But on the technical front there are a handful of faults, the first is the underwhelming score and some truly questionable CGI, which, considering this is the man who brought us Jurassic Park, is truly bizarre. As stated earlier, the key take aways from this feature are the performances and the overt jab at the Trump presidency. The Nixon years were rife with protest, hatred, scandal and it all ended rather pitifully but Nixon’s attitude to the press bears a similarity (in all honesty, nothing is similar to what is happening right now) to how Trump shuts out the press and is therefore more relevant than ever. This urgency to get the story out while it reflects contemporary politics serves to highlight one of the biggest causes of the film’s faltering. Saying history is cyclical is nothing new to anyone who knows anything about history but the fact that everyone involved is trying to derail that endless cycle of betrayal and cover-up is extremely admirable. Having said that, the final piece feels a little rushed, from the simplistic characters to the inconsistent VFX to the fact that the choice was made to focus solely on the exploits of The Washington Post alone, rather than being a double-header narrative going back and forth with The New York Times and their germinating story. It could also have helped soften the blow of the Rogue One-esque ending which offers the briefest tease of the Watergate break-in. In reality, these are only minor problems but they are problems that have no business being present in a film with resources of this calibre and issues at this level downgrade an outstanding film to a merely decent one. With the high profile success of Spotlight I wouldn’t expect this to be the last mainstream release about investigative journalism but in order to push actual change, I think they need to be stronger and significantly bolder – the trouble with that being, the more we get with the same formula, the more diluted the impact will be. Streep and Hanks’ first scene together is typically Spielbergian. Both characters of immense power and charm meet in a quaint, unsuspecting setting (having a monthly scheduled breakfast) which starts pleasantly enough but quickly devolves into talking over one another before a very distinct shift in tone causes one to fall silent and analyse the other’s intentions. And the whole thing, up until that emotional crescendo, takes place in a single unbroken shot. It’s far from impactful on the story but it serves as a wonderful introduction to the relationship between these two individuals and shows off just how good everyone involved (in front of and behind the camera) is at their craft. One of the more unsuspecting roles is that of journalist Ben Bagdikian played by Bob Odenkirk. Odenkirk has always been a great comedic actor but when given a dramatic role he really shines. It’s hard to be memorable, let alone standout when competing with the likes of Streep and Hanks but Odenkirk really feels like he bridges the gap between quirky office drama and national secrets thriller.